For years I've sheltered my girls from seeing the news, typically because there is just one bad story after another. I didn't want them to know that the world wasn't all unicorns and princesses, and that life generally isn't a fairy tale. However, they are becoming old enough to know better, that the world isn't always so nice. My need to shelter them from the news started when I had the TV on during the aftermath of Hurricane Katrina. Kiki was four and had been playing in the next room. I didn't think much of what was on TV because after all, they were just talking about weather, and she never seemed to pay attention when the news was on anyway. Kiki had been singing and playing and then all of the sudden she was quiet. When a normally not so quiet child becomes quiet, that usually means trouble, so I looked over to see what she was doing. She had walked into the family room and was standing just staring at the TV. Before I could turn the TV off or do anything, she asked "why are people standing on their houses, Mommy?" I found the remote and quickly turned it off, and told her not to worry about it, that it was just a TV show. She wasn't buying it. "Mommy, what's a hurricane? Can a hurricane come to our house? Are we going to lose our house too?" Obviously she picked up on more than I had realized. All of that time she was playing and singing she was also listening. I decided then that I would never have the news on in the house when the girls were awake. To me it just wasn't worth the risk. However, I knew that I couldn't do this forever, that eventually they would go to school and would hear other kids talking about events on the news. So I've slowly and selectively allowed them to see some news stories I thought they could handle, with me sitting with them and explaining it to them. 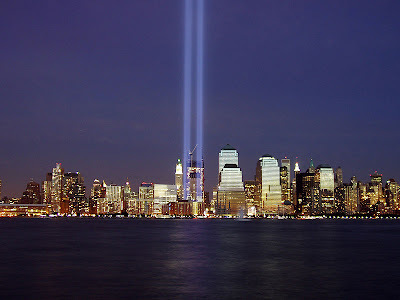 There is only one topic I've completely avoided: September 11, 2001. I have really grappled with how to explain this day to them. First of all, on September 11, you can't really turn the news on without media showing the images over and over (and over and over and over), and that is definitely something I am not sure I want them to see just yet. But I know they are going to hear about it eventually, and it could very well be on the school bus. I know the school celebrates Patriot Day and the children are encouraged to wear red, white and blue that day. Last year I know they were not told the purpose behind Patriot Day; Boo was just a Kindergartener, and Kiki was in second grade. I asked the teachers and found the kids were not told anything about 9-11 specifically, but that the focus was more on celebrating our country's heroes - police officers, fire fighters, rescue workers, and of course, our soldiers. The girls decorated flags, sang patriotic songs, etc., but not much else. I know the time is coming though, especially for Kiki, who is now in third grade. If I don't tell her about it, she is going to learn about it on the school bus, the playground or in the cafeteria. Or it may be that she learns about it from her teacher, which would be better than hearing about it from another child. I know her teacher would tell about the events less dramatically, and much more factually, than a nine year old child. I worry some, because Kiki tends to internalize these types of things. She often shows empathy and even cries when she hears about people who suffer. She thinks about stuff like this for days, and wants to know as much detail about it as we will tell her. I also know that she would worry this type of thing could happen again. How do you tell your children about something like this? Eventually all children know that there are "bad guys." This is evident whenever you visit any playground and spend some time watching children playing games like cops and robbers. Our girls know first hand about some of those "bad guys" since some of those very types of hooligans broke into their cousins' house and stole their electronic toys and Halloween candy. I've warned them about the dangers of strangers and how important it is to stick close to Mommy and Daddy when out in public. They even know the sadness of stuff like kids who are sick and even sometimes die from cancer. But how do you explain the events of September 11, 2001? How do you tell them there are people so mean in our world that they wanted to kill thousands of people in one day? That they wanted to blow up buildings and airplanes, and take away lots of mommies and daddies, all because they hate us so much? I can't even begin to think of how to tell them. I do know I want to tell them the gentlest way I can, and focus more on the heroism of that day, than the horror. Teach them that we should always honor and respect our soldiers, police officers, firefighters, rescue workers, and everyone else who puts themselves before others. After all, isn't that what we should all remember about this day? That in the face of adversity, our country stood UNITED and refused to let the meanies win. very well said. and super cute matching outfits! i have a 6yr old and i've touched briefly on what happened. i think this year might be the year to explain things further especially since i know she'll probably watch all the stuff i dvr'd on history channel to watch tonight about 9-11. My son was 4 when it happened, and I couldn't avoid it. I explained it to him as best as I could, given his age. As he got older, we talked about it more, because every year it would come up on the anniversary. My daughter is now 5 and we never talked about it at all. To be honest, I never really thought about it - she has managed to never see the footage (not in purpose - just happened that way). And I think that 9/11/01 is so ingrained in our minds that I tend to assume that everyone knows abot it - it just IS, you know? Not that I really think she knows (duh), but that I never really thought about it, since it - as I said - just IS. Really thoughtful post. My daughter is just 11 and ready for these discussions now. We've always talked about how there are more good than bad people in the world and that good people like firefighters, etc help protect us from people who want to harm us. My son is six and also curious now, but I try and keep it as simple as possible. I too never have the news on when my kids are around, but I think if you watch something with them it is a good way to open up discussion. However, the images of 9/11 are still hard for me to swallow, so I don't think it's OK to have them watching any of it (esp. unsupervised). Many children do though, so you are wise to start talking to them early. Thanks for this post. That is such a hard, hard topic to broach with children, esp. when you know that your youngest is going to take it a little bit hard. I'd suggest trying to keep it pretty factual, explaining that sometimes, other countries or cultures or people have very different views - and are angry when others won't accept their views. And instead of handling it maturely, they turn to violence. With younger kids, I'd probably make a point about how their mommies and daddies and teachers didn't do a good job teaching them about tolerance. Make it an opportunity to promote equality, even in the face of such a tragedy. I'd tell them that yes, a lot of people were hurt. See if you can point out some good things that came out after the events of 9/11, the way our country banded together, the war, democracy in Iraq maybe? Not everyone agreed with the war, but a big emphasis on how the United States defended itself might be appropriate, and a way for you to tell them that you will protect them. I'm just not sure. But I know it's better to hear it from you, than anyone else.